Much of northern Mali is arid and barren, land where only pastoralists can make a living. Although the population of Mali is quite low overall, the majority of the people are concentrated in the wetter south, where the agricultural land is becoming scarce. There is land degradation in parts of the arid north, and this has been made worse by the droughts of recent years. There is erosion also in southern Mali, with its higher rainfall and better land. Cotton is the most important cash crop in the south. There are some very interesting traditional techniques of conservation in Mali - which are not widely known about. However Mali has not had much experience of soil conservation programmes and it is only in the last few years that a significant number of projects have started up. First, we visit an area where there is a wide range of conservation techniques, all entirely traditional the Dogon Plateau. Second, we look at one of the longest established soil conservation projects, situated in the cotton growing zone of southern Mali - the "Projet Lutte Anti-Erosive" (Anti-Erosion Project) of the "Compagnie Malienne de Developpement des Textiles" (Malian Textile Development Company). The Dogon Plateau is home to a wide variety of traditional soil and water conservation measures. There can be few other areas in sub-Saharan Africa where the local people have devised such a range of conservation techniques including hillside terracing, stone lines, earth basins, planting pits and earth mounds. These traditional methods of conservation have been developed mainly to cope with the acute shortage of soil and rain on the plateau. Some of the techniques could be improved, and the people urgently need support to reduce erosion further. Nevertheless the main lesson from the Dogon Plateau is that there is much to learn from traditional ways of doing things which have often been ignored. Soil and water conservation projects should always begin by looking at what the people are doing for themselves. Situated in the eastern part of central Mali, the Dogon Plateau is well known to outsiders for its picturesque villages and spectacular cliffs and escarpments. The plateau is hilly and covered with rocky outcrops. But for the agricultural Dogon, the shortage of land to cultivate has always been a problem. Less than a quarter of the plateau's surface can be planted with crops, and much of the soil is just a thin cover over the rock. The population density of about 25 people/km2 is very high for an area with such little soil and such low rainfall. Strangely, the population is most concentrated on the rocky hillsides where there is the least cultivable land! In common with several other regions in Africa, one of the reasons that the people originally moved to the escarpments, was for security from raiders. Many families have chosen to stay there. The large population simply cannot feed itself in times of drought. In low rainfall years many young men go to the towns and the better agricultural areas in search of seasonal work. Some families have even migrated from the area, settling in the south of Mali where there is better soil and more reliable rainfall. The Dogon plateau is a low rainfall area and lack of rainfall has become an even more severe problem over the last 20 years. The annual average rainfall has diminished from 555 mm to as little as 465 mm during this period. Not only have crop yields suffered, but drinking water has become more scarce. Streams dry up earlier in the season, and the water tables have gradually fallen - which means that wells and boreholes have to be dug ever deeper and deeper. As well as being low, the overall rainfall is also unreliable and individual rainstorms can be very intense. Naturally there is considerable runoff from the rocky surfaces. This leads to erosion of soil on the fields below- if the land is not well protected by soil conservation measures. Wind erosion is also a serious problem here during the dry season. Much of the erosion caused by rainfall occurs on land which is too rocky to be cultivated. This is grazing land, and erosion here means that less vegetation grows for the cattle, sheep and goats. At the same time, money which is sent back to the villages by those working away is often used to buy livestock...and the problem of the grazing lands increases. The Dogon however depend principally on their subsistence food crops. Most of the land cultivated is planted with sorghum and millet. Groundnuts are also common. In addition to rainfed farming, irrigated vegetable production is important close to the watercourses. The most common vegetable here is onions. Because of their historical dependence on their food crops, the Dogon have simply had to develop methods to conserve their soil and water! Without these, they could not have survived. Each of the main measures is described below. Details of sizes and specifications are given in the technical section of this book. This technique now less important than it was for three reasons. 1. People are gradually moving down from the hillsides now that there is no longer a security problem. 2. Construction and maintenance use great deal of labour. 3. Recently, the lack of rainfall on the shallow soil has resulted in poor crops within the terraces. 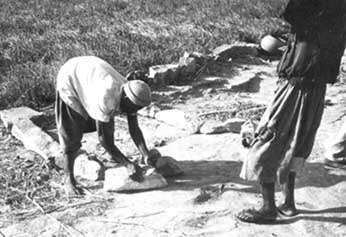 Throughout the flatter areas of cultivation, wherever there is any loose stone, the Dogon construct stone lines. These lines are placed across the slope, in order to slow runoff and reduce erosion. Often the lines are just a string of individual stones - resembling crocodiles' teeth! These lines could be improved. The stones could be placed more carefully to avoid small rills forming between them, and the lines would be more effective if they followed the contour. These are larger structures than the stone lines, and less common. More labour is involved. They are preferred to stone lines where the land is more sloping, where erosion is worse and where there is a good supply of stone. As with stone lines, these bunds are built across the slope, and the idea is again to slow runoff and reduce erosion. But again they would be more effective if they were built more carefully, and if they followed the contour. The technique of making small earth mounds between plants while weeding is very widespread on the Dogon plateau. These mounds are seen elsewhere in Mali. 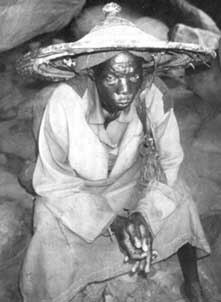 It is possible that the technique has only been adopted by the Dogon in the last half century. It is certainly growing in importance now. When the young cereal crop is first weeded in July, the weeds are scraped together and covered by earth in the form of mounds between the plants. Each mound is about 20-30 cm high. The mounds last throughout the season and have two useful effects. First they tend to slow down runoff as it flows through the field. Secondly the mounds act as "mini-compost heaps", and help maintain soil fertility. Some Dogon make small earth basins in places where the soil is deeper. The idea is to catch and hold every drop of rainwater where it falls - and of course this stops soil being lost also. This is one of the most effective techniques of all but it is quite labour intensive. Each basin (of between one and four square metres) is made by building an earth ridge in the form of a square. Construction takes place in the dry season, before planting. The ridges are built-up during weeding. "When we make the basins and pits the water which would have left the field stays put, and so in the dry weather there is less crop damage. The yield is now higher. When we have enough rain the crops ripen well. By harvest time when we haven't used the techniques the millet can dry out, but everywhere we do use the techniques, the millet stays green". 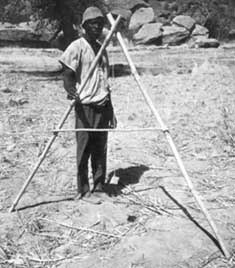 As with earth mounds, this is a technique which is also found outside the Dogon plateau - even as far away as Yatenga in Burkina Faso where it is known as zai. Planting pits are quite small - only 15-20 cm deep and 30 cm or so in diameter. These pits are dug about a metre apart. Manure is added, and then several cereal seeds are sown into the centre of each pit. The benefits are a concentration of rainfall around the plant roots, and a concentration of the effect of the manure/compost. Planting pits can be used together with most other techniques. This is a popular technique although it is not as widespread as earth mounds. One measure which is becoming less commonly used is trash lines. These are narrow strips, made from cereal stems or even cut bush, which are aligned across the slope. They have the effect of slowing and filtering runoff and soil fertility is built up when the vegetative material decomposes. However, the problems are that the trash can easily be blown away before the rains come and cutting of foliage has recently been made illegal. Onion gardens made with "transported earth"
The Dogon have an extraordinary tradition of creating onion gardens on bare rock! This is not a conservation measure in the same sense as the techniques already described, but it does show the skill with which the Dogon manage the little soil and water that they have. 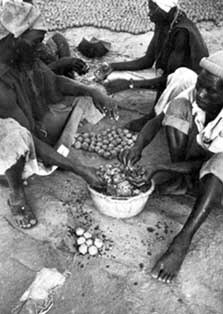 Market gardening has been practiced for a long time on the Dogon plateau. Vegetables, and particularly onions, are grown close to seasonal watercourses, from which they are irrigated. However there is not enough land on the riverbanks, and in some areas there is bare rock on both sides of the watercourses. It is precisely here that the Dogon create new land for cultivation. The "transported earth gardens" are started by building a network of small stone squares on the rock surface. Each square has sides of about one or one and a half metres. Silt is then dug from the riverbed, or earth collected from cracks in the rock nearby, and carried to the site. The squares are filled to an initial depth of about 15-20 cm. Manure or compost is added to improve the fertility of the transported earth. Vegetables are planted in these gardens during the dry season. Regular and careful watering is then carried out, by hand, from the riverbed. Onions mature quickly in the shallow soil. After harvesting the bulbs are crushed into pulp, squeezed into balls, and dried on the bare rock close to the gardens, ready for marketing. Dogon society is still strongly traditional in all aspects, including agriculture and soil and water conservation. 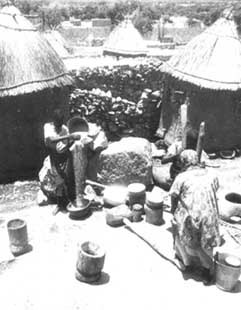 Agricultural land is divided into common fields, family fields and small plots belonging to the women. The main fields are used for sorghum and millet, but the women prefer to grow groundnuts, voandzeia ("Bambara groundnuts"), and various vegetables on their plots. For most cropping activities the women join the men in the fields after they have prepared the midday meal. However women are traditionally not involved in building soil and water conservation structures except in the construction of onion gardens when they carry soil. 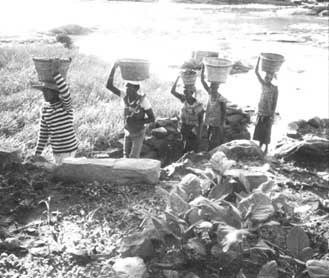 There is no strong tradition of group labour in soil conservation on the Dogon plateau. Normally the male members of the household work alone, though in some cases friends and neighbours may join together in informal working groups. However a new agricultural development project on the plateau - the "Projet Vulgarisation Agricole" is attempting to involve village groups, which include young women, in soil conservation activities. The idea is that village working groups can speed up construction on an individual's field. 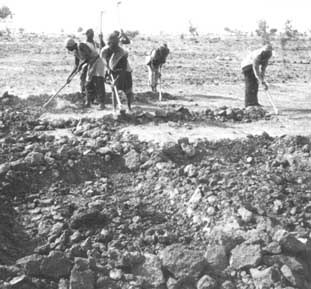 Some payments are made to the groups for their labour. There are no figures available for the benefits of the various techniques, either in terms of improved plant performance, or soil conserved. There is simply not enough known about the traditional systems of conservation. But what is certain is that the Dogon could not have continued as agriculturalists without these systems and would not continue to use them if they didn't think it was worthwhile, given the huge amount of labour which they take. Despite all the techniques which are used by the Dogon, erosion is still a menace on the plateau. Overpopulation has lead to over-use of the land. The amount of cultivable land is growing smaller each year, and families are having to migrate. Help is urgently required to improve the conservation techniques, and to assist the people to carry out the work. 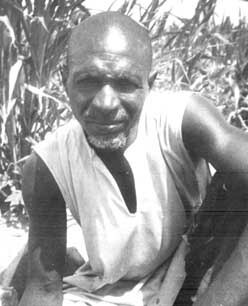 The Projet Vulgarisation Agricole, (PVA) which is an agricultural extension project, was set up at Bandiagara in the mid-1980s to help improve agriculture on the Dogon Plateau. PVA has a small soil conservation unit, and has recently begun to give technical assistance to the Dogon. The project has concentrated initially on improved designs for stone bunds. Training courses have been held, during which the use of the "A. frame - a simple surveying instrument to lay out contours - has been taught. 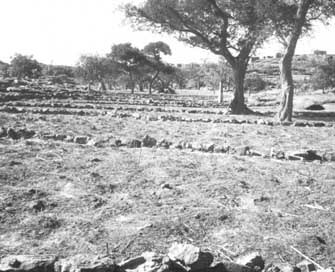 The stone lines and stone bunds are the techniques which are in most need of improvement. Better placement of stone, the introduction of a foundation trench, and alignment on the contour are all improvements which PVA is trying to introduce. But this is only a first step there is a great deal to do, and the work is urgent. The Dogon are desperately short of appropriate hand tools to work with. This again is an area where some projects have begun to help. 1. The Dogon plateau has a rich variety of soil and water conservation techniques which have been developed by the local people and implemented without outside assistance. 2. The combination of limited land, low rainfall and a growing population have forced people to look after their land. Without conservation of soil and water, cultivation could not have continued. 3. There is very little knowledge about the traditional techniques here - and there is much to be learnt. This is also true of other parts of sub-Saharan Africa. Such systems are usually ignored by soil conservation "experts ". 4. Several of the measures could be applied in other parts of sub-Saharan Africa although most of them cannot be used in places where animal traction is used. 5. After careful study, these traditional techniques should be used as the starting point for conservation projects on the plateau. 6. Improvements could be made to some techniques - particularly the stone lines and stone bunds. 7. In spite of their efforts the Dogon need urgent assistance in the field of soil and water conservation because of the natural rate of erosion on the plateau. They need both help to improve their own techniques, and in the provision of tools. "I learnt these techniques from any parents. If my children learn to use these techniques I think they will benefit in the future. They should do as I do. We are not here on earth for ever, and if you don't work you won't profit. There really are advantages to using these traditional techniques".